If you blog, you will want to rank highly in search engines. To do this, you need to write content that helps Google understand it in order to rank it. 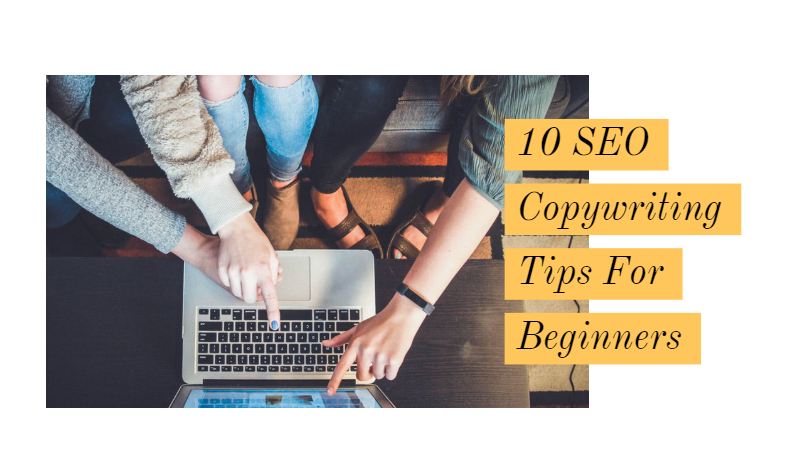 Using these 10 SEO copywriting tips in your blog posts will help you. You do not have to be an expert in SEO. Regular bloggers can use these tips to improve their rankings. If you use a plugin like Yoast, you will be able to track if you are doing this correctly. Make Sure Your Headlines And Slugs Reflect Your Post. Spend time creating your headline. If you are writing about copywriting tips for SEO make sure this is included in the slug. A slug is a piece of text within your URL that helps SEO. It does not have to be the same as your headline. Then, once you know what you’re writing about, spend time on the words you use in the headline. Include numbers – like we have in this post. Then, work on the phrases – a study by Buzzsumo shows the most successful phrases that were shared on Facebook. You can also use the famous coschedule headline analyser. Use Keywords In Headings. Use the most important keywords in one or two headings in your post. Do not overdo it. Your Yoast plug-in will tell you if you have over-used it. Improve Your Meta Descriptions. You should base this on your introduction at the beginning of the article. After your header, you need to tell your readers what you are going to be covering in the post. Yoast says: ‘The meta description is a snippet of up to about 155 characters – a tag in HTML – which summarises a page’s content. Search engines show the meta description in search results mostly when the searched-for phrase is within the description, so optimising the meta description is crucial for on-page SEO.’ Work on this and edit in in the designated edit function. Include Alt Text In Your Images. When you add an image, you will be given the option to add ‘Alt Text’ when you edit it. To find out what’s in an image, search engines look for the ‘alt text’. Use this feature to include words relating to your post or headline. Include Outbound Links. Make sure you link to trusted, authoritative websites. This informs search engines that you’re providing valuable, reliable resources for your readers. Include A Focus Keyword. You must include this in the first paragraph of your copy for the best results. We have used ‘SEO Copywriting Tips’ as our focus keyword for this post. Make Sure Your Post Is Longer Than 300 Words. This is the recommended minimum for search engines. You can write longer copy as well. Improve Your Readability Statistics. If users can’t understand what you write, you’re wasting your time. Make sure you write in the active voice. Write in user-friendly short paragraphs with lots of white space in your post. Make sure that you have formatted your text correctly by using things like lists, the correct font, the best colours, and headings and sub-headings. 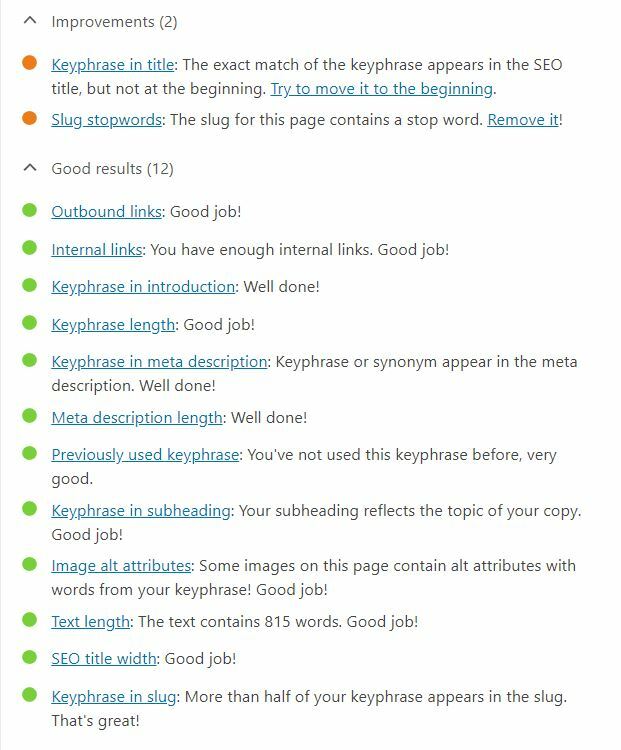 If you use WordPress and Yoast, you will get an analysis that looks something like this. This is the one for the post you are reading. If you have made mistakes, it will offer suggestions on how to improve these features. We are not concerned about the first two and are happy to leave the post as is. You can work on each issue, until you are happy with your post.